A Christmas digi kit in Black & White. 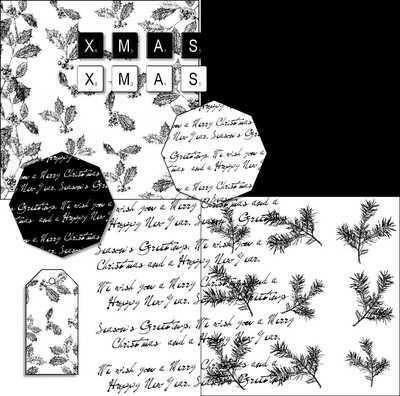 A solid black background, script, holly and fir png papers; two script shapes, one black, one white; a tag with holly and two sets of Scrabble letters in black and white to spell 'Xmas'. Each paper is 6" square. All the pieces are in png format (transparent backgrounds). 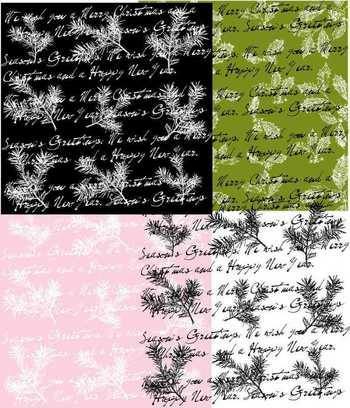 You can change the colour of any of the papers and layer them with each other, and other papers, to create many different backgrounds of your own. Cut out and layer the Scrabble letters, or add them directly to your paper (add a drop shadow for 3D effect). If you don't have a program that will manipulate transparent png files, let me know, and I will make you jpgs instead. Below are a few examples of layering and changing the colours.